With the October 6th event not far away now, the leaks are coming thick and fast in terms of mobile hardware. First we had an image of the budget Lumia 550, shown below, then there were pricing suggestions for the Lumia 950 and 950 XL flagships from a Spanish site. Rumoured specs include a Snapdragon 210 chipset and a 720p 4.7" AMOLED screen, so think of this as a Lumia 535 successor. This is the device that will hold down the bottom end of the Microsoft hardware family and will compete directly with OEM offerings from the like of Acer, LG and Yezz. Also leaked were alleged launch prices for the (alleged) Lumia 950 and 950 XL flagships, at 659 Euros and 749 Euros respectively, working out, in the UK, to around £550 and £630 including VAT, which (if true) is ostensibly miles too high to attract many SIM-free purchases. Rumour has it that each will launch with a healthy accessory bundle (think headphones, Continuum dock and cables) but those prices are still way too high on the open market. Of course, most flagships are bought on contract these days, and here the 950 pair will bump noses with the iPhones and Galaxy S6, and so on, all for the same monthly outlay. Though will Continuum be enough to tempt the man in the High Street to plump for the Windows 10 Mobile smartphone over the competition? PS. Anyone else notice that the time in the 550 screenshot is '9:50'? Do you think Microsoft is trying to tease us with something? Cough. 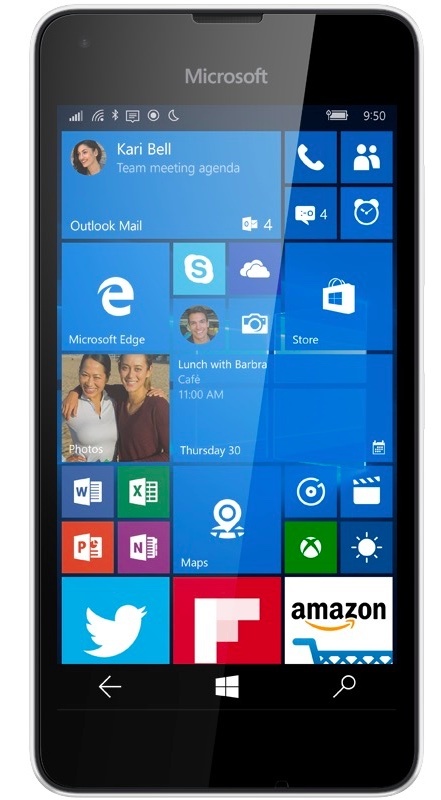 Filed: Home > Flow > Another leaky week... Lumia 550, 950 pricing?